Preview, organize, edit, and print your digital photos with Photo Manager. Find images on your computer and remove duplicates. Assign keywords, ratings, and captions to your photos, and then pick the required photo from the database in one second. Photo Manager displays classic list of thumbnails for images in a folder and lets you explore folders and preview photos located on your compact disks or DVDs, local disks, removable disks or network drives. Preview photos in full screen mode or run a slide show. Print your photos one image per page, or multiple images per page with optimal layout, or as a contact sheet. Customize and format page headers and footers as desired. Import images from scanner or digital camera. Adjust levels, exposure, recovery, fill light, blacks, white balance, brightness or contrast, hue and saturation, correct color balance, remove noise, and use editor filters, such as sharpness, edge detection, and even view the Fourier Transform of selected photo. Use Auto Color, Auto Levels, and Auto Contrast adjustments. Save edited photo to a new file in common image formats. Red eye correction. Assign keywords, categories, ratings, and captions to photos in Tags view. You can select desired images and save them as HTML album for sharing in the Internet. Search for images in the database by keywords, ratings and categories in DB Search view. Pick required images in a second and manage the results: preview, edit, print or copy photos. Search your local disks, CDs or DVDs, network drives for images, and put all images to a special list for your further work. Photo Manager allows you to search for and manage duplicate images. It is easy to manage any images that are shown in any view of the program. You can sort, copy, move, delete image files or entire folders with images. Photo Manager displays detailed information about the selected photo, including EXIF properties and camera manufacturer notes (Maker Notes). 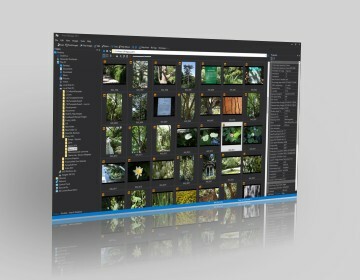 With RAW format plug-ins Photo Manager previews photos created in RAW format and can develop and save full size images. See the list of supported RAW formats and cameras. Photo Manager supports plug-ins. Currently we provide the plug-ins: Canon RAW format Support for PowerShot and EOS cameras; and the Get Photos plug-in for Canon cameras. The RAW formats of Nicon cameras and other manufacturers are also supported. FontExpert and Photo Manager resources.